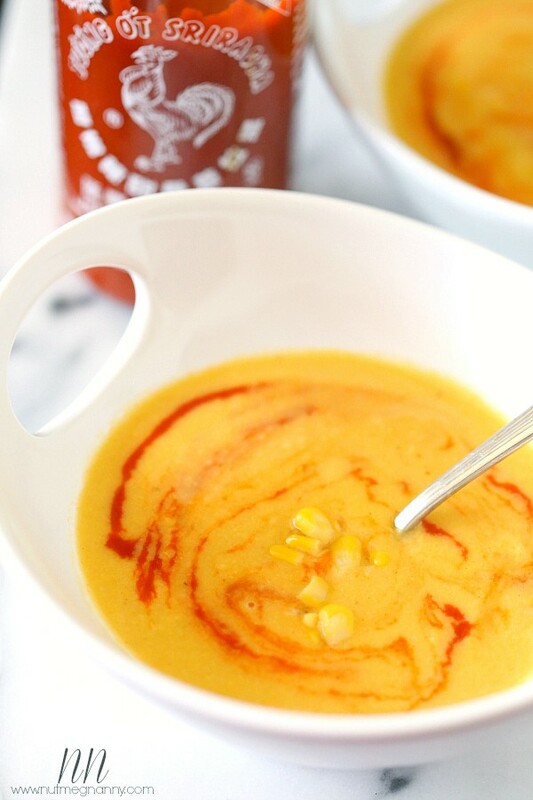 This smoky sweet corn soup combines the best super sweet corn, smoked paprika, coconut milk and a drizzle of sriracha. Sweet corn is one of my favorite summer treats. 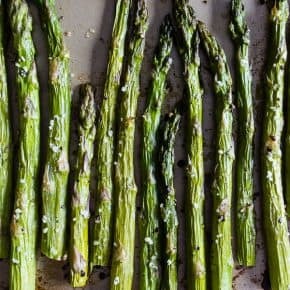 Normally I will just eat it grilled and slathered with butter but sometimes I get a craving for something a little different. KitchenPlay asked me to team up with Florida Sweet Corn Exchange to talk about my love for Sunshine Sweet Corn. 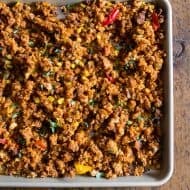 I wanted to develop a recipe that would show off the natural sweetness of the corn but also bring in a bit of spicy flavor. I have been in love with making soups in my Vitamix for about a year now. 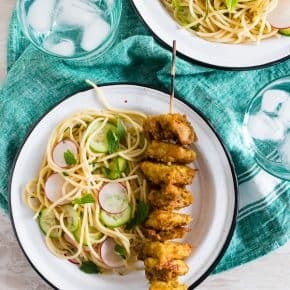 It makes the whole process so quick and simple you can go from starving to full in just about 30 minutes. For this soup I simply sautéed some fresh corn kernels and sweet yellow onion until everything was soft and sweet. Then I threw in some smoked paprika because I still cannot get enough of that stuff. I find myself putting it in EVERYTHING. I think I might need an intervention. Instead of using just stock to thin out the soup I opted to use coconut milk. Which is another one of my currently-obsessed-with products. Oh and see that beautiful little drizzle of red? That my friend is sriracha – smoked paprika, coconut milk and sriracha, just a few of my favorite things all together in one bowl of springtime soup. In a large, high-sided skillet set over medium heat add olive oil. Once the oil is hot add in onion, sweet corn, paprika, salt and black pepper. Sauté until the onion is translucent and the corn is soft. Add hot corn mixture to a high-powered blender (I used my Vitamix) and add can of coconut milk. Blend until smooth and add back to the skillet. Warm over medium heat and add in stock if needed to help thin the soup. The amount of stock you use will depend on your desired consistency. Serve warm with a drizzle of sriracha. 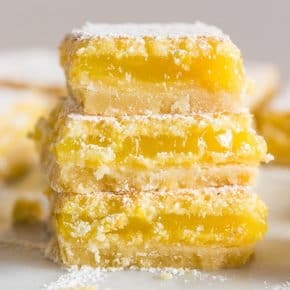 Disclosure: I worked with KitchenPlay to bring you this delicious recipe. I was monetarily compensated for my time but all opinions are my own. 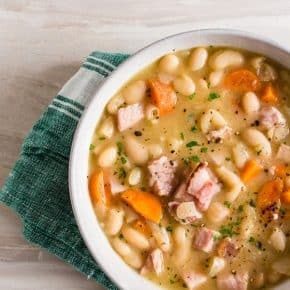 This soup looks fabulous! I love it! I’m in love with this soup!! I think this could count as a healthy breakfast, right? Or lunch? Or dinner? 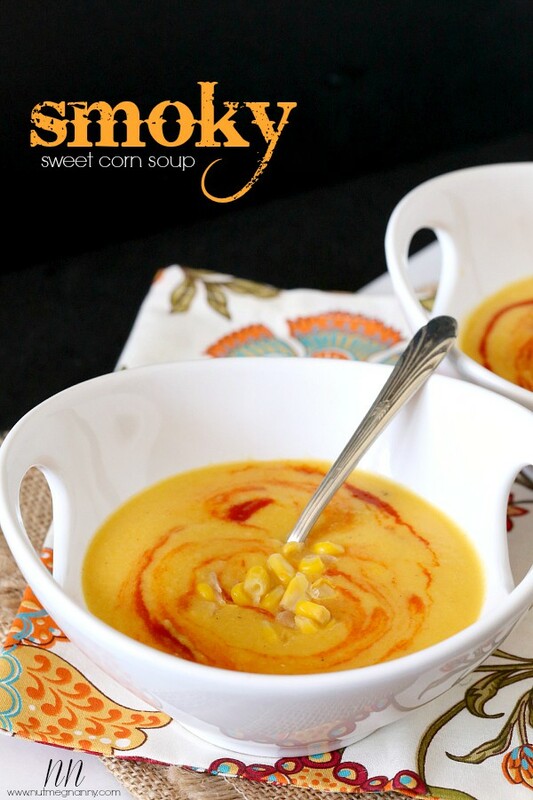 Smoky plus corn plus soup equals a happy me! Smoky and sweet can’t be beat! Mmmmm, corn and smoked paprika. I don’t blame you for loving the stuff and think it would be awesome in this soup. Mmmmmm….this is happiness in a bowl! I got a Vitamix last summer – life changing. I could not believe it was capable of making soups. Or bread! 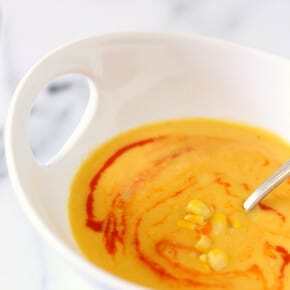 *mind blown* Absolutely love sweet corn and this soup! This soup is so gorgeous! My Bacon Slayer loves him some corn soup/chowder. I think the stuff is way too sweet for a soup. You’re combo with sriracha and smoked paprika could be a great compromise! I can’t wait for summer corn! This soup sounds incredible, great flavors and a stunning color. Oh, I love this soup! I love soup even on hot days (like today! 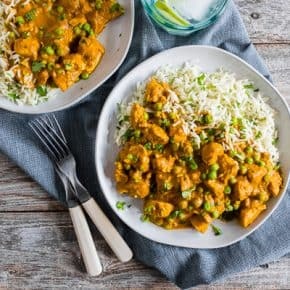 )and could use a bowl of this now for dinner-great recipe, Brandy! I’m obsessed with smoked paprika too! 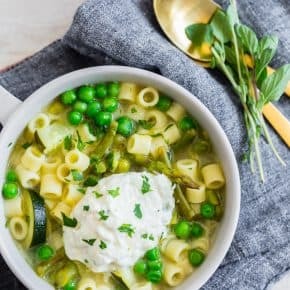 This soup looks incredible! I can eat soup all year long. 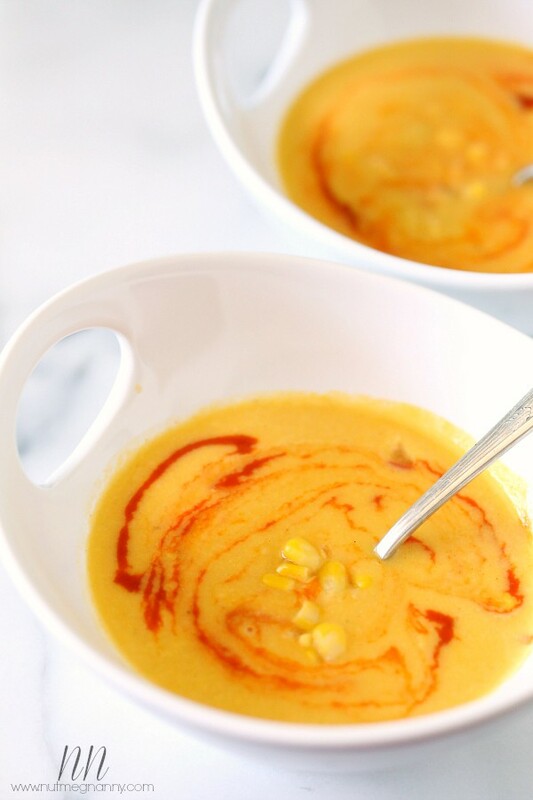 As a fellow smoked paprika-obsessed, corn-loving gal…to this, I say YES! A million times YES! i love corn so much. 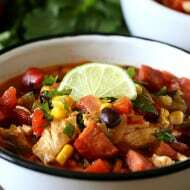 this soup sounds great and you’ve depicted it very nicely! love the sriracha swirl! Oh, THIS is going into next week’s menu! And I also cannot get enough paprika lately!! What is UP with that?? 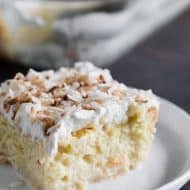 I have added it to nearly every dish I’ve made this week! This looks delicious. Please add me so I can pin and enter. Thank you. I made this soup for last night’s dinner. One of the best corn soups I’ve had! My husband said it was the best I’ve ever made! So easy too. This one is a keeper! I’m making your Spicy Thai Pumpkin soup tonight! Hi Sharlee! Thank you so much for letting me know 🙂 I LOVE simple soups!